There are a several different causes of feline hair loss, or alopecia. Some causes of feline hair loss may include flea allergy dermatitis, food allergy, inhalant allergy, notoedric mange, pyoderma, ear mites, and psychogenic alopecia. Although this is an extensive list of causes of hair loss in cats, there may be other underlining cat health problems that could be causing your cat’s hair loss. In order to properly diagnose the underlining cause of your cat’s hair loss it's best to consult your cat’s veterinarian to ensure proper diagnosis and treatment. Flea allergy dermatitis, or flea bite hypersensitivity, can sometimes result in feline hair loss. Flea allergy dermatitis is a skin allergy in cats that is relatively common and is caused by flea bites due to the allergens found in the flea's saliva. This condition causes cats to excessively groom resulting in further irritation and damage to their coat and skin. Symptoms include your cat consistently scratching their skin, persistently biting their skin, thinning coat or poor coat condition, scabs or bumps on their skin and feline hair loss. Your cat's veterinarian may prescribe antibiotics to treat secondary skin infections and anti-inflammatory injections to reduce itching. Usually as a last resort your vet may recommend a treatment method called hyposensitization. This method involves injecting a flea antigen into your cat’s skin, which is thought to build up their immune system and reduce sensitivity to flea bites. It’s important to use a recommended and safe cat flea treatment to eliminate the fleas. You should also treat other pets in the househol since fleas can easily jump from one pet to another. It's also essential to wash and disinfect your cat's bedding, cat toys, and all their accessories in order to reduce the chances of another infestation. A food allergy reaction occurs when your body has an immune response to a relatively harmless food product such as milk, wheat, eggs, etc. Cat food allergies is much more common than most cat owners realize. Cats can have an allergic reaction to an ingredient that they have been eating for several years. Symptoms of food allergy in cats include vomiting, diarrhea, and hair loss (due to excessive itching and scratching). Your cat's veterinarian may recommend a food trial to see if symptoms improve or worsen, in order to reach an accurate diagnosis. Often, the best treatment option for cats with food allergies is to identify and eliminate the food that is causing the reaction. Your vet may also recommend a homemade or special commercial diet that is free of the allergen that your cat is haveing a negative reaction to. An inhalant allergy, also known as atophy, is an under diagnosed condition found in cats. It is caused by allergens in the environment such as pollen, mold and dust and has been known to cause feline hair loss. Symptoms include intense itching of the ears, face and neck, as well as scabs, legions on your cat's body, hair loss and visible bald spots. Once the allergent that is causing your cat's hair loss is identified, your cat's veterinarian may recommend that your cat is kept away from the allergen causing the symptoms, if possible. Allergy shots or allergy desensitization may also help with this condition. Corticosteroids and pr fatty acid supplements may also be used, but may not completely cure the condition. Notoedric mange , also known as feline scabies, is caused by the mite called Notoedres cati. It is a very contagious skin disease and can cause feline hair loss. Your cat's head, neck, forelegs, paws and genitalia area may be affected by the mites. Infection of this micro-organism is often caused by animal to animal contact. Symptoms include hair loss and scabs on your cat’s skin, especially near the tip of the ears and may spread to your cat's face and neck. Notoedric mange can cause secondary bacterial skin infections. Treatment includes cutting your cat’s hair if they are a semi or long haired cat. Your vet may also recommend cleansing the area where there are crusted scabs to soften thick crust, in addition to weekly lime sulfur dip. Worm and flea products such as Revolution may also be recommended and has been proven to be successful. Pyoderma is a bacterial infection. It occurs when your cat’s excessively scratches or bites their skin due to excessive itching. Pyoderma can range from mild with superficial pyoderma to severe with deep pyoderma. This infection causes both hair loss and lesions that are filled with puss on your cat’s skin. Your vet will conducted tests such as skin scrapes, allergy tests, and complete blood count, to find out the underlying cause of the pyoderma, so that he/she can effectively treat the illness. Your vet may recommend antibiotics to help kill the bacterial infection and/or antibacterial shampoos and creams. Ear mites are spider-like, external parasites that infest your cat’s ear and survive by feeding off of the wax and oil inside their ears. 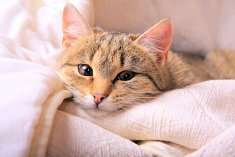 Feline ear mites mostly effects kittens but can affect cats of any age, and can easily be passed amongst cats. Symptoms of ear mites include bleeding from the ear, coffee-ground like debris in your cat's ear, brown or red discharge from the ear, scratch marks resulting from excessive scratching and feline hair loss. Secondary skin infections may also be present. Treatment of ear mites depends on the severity of the condition. Treatment may include removal of the debris in your cat's ear and applying a prescription insecticide prescribed by your vet. Your vet may prescribe a topical medication, although there are over the counter medications available, your vet will be able to prescribe a more effective medication to get rid of the infestation. Psychogenic alopecia, also known as over grooming, is often caused by stress, but can turn into a compulsive behavior even without stress. Grooming is normally very relaxing to cats, and is a way for them to self soothe, however when a cat is overly grooming they may begin to pull out patches of fur, especially around the thighs, groin and abdominal areas causing feline hair loss. Symptoms include obsessive grooming and bald patches. There may also be signs of redness or raw skin, especially around the sites where your cat has removed an excessive amount of fur. Initially your cat's veterinarian will run tests to ensure that the hair loss is not caused by a skin infection or parasite problem. Your cat’s vet may then recommend attempting to eliminate the stress factor that may be contributing to your cat’s over grooming and obsessive behavior, or trying different techniques that help to calm your cat such as petting sessions and play time.You vet may also recommend trying a food trial to rule out food allergies. As a last resort, your cat’s vet may recommend the use of antidepressant or anti-anxiety medication.